Hailed by many as the top rising star of Blues/Rock, Eric delivers a powerhouse performance that has left audiences in 25 countries (and counting) mesmerized. 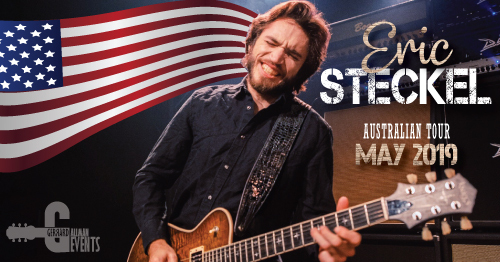 He brings an energy and passion to the stage that never disappoints and is a must see for fans of vintage guitar rock. This is a show you won’t want to miss! Few young guitarists can improve on Eric Steckel’s impressive resume. Eric’s debut CD, “A Few Degrees Warmer”, was recorded live in April 2002 when he was just 11 years old. It wasn’t long until he appeared at the 2003 Sarasota Blues Festival where Eric’s powerful set became the talk of the day. Before the night was over Eric was introduced by British Blues/Rock legend, John Mayall as the youngest guitarist ever on stage with the Bluesbreakers. Eric left a lasting impression on Mayall and, in 2004 Mayall invited Eric to appear in Sweden, Norway and Denmark during The Bluesbreakers’ Scandinavian Tour. In early 2005, Eric traveled to Los Angeles where he joined Mayall for session work on the “Road Dogs” record. Throughout his teens and young adulthood, Eric released several critically acclaimed live and studio albums. 2006’s “Havana” was a hit among Blues guitar lovers and tracks from this album are still featured often on SiriusXM’s Bluesville station. 2008’s “Feels Like Home” featured the talented Duane Trucks on drums and recalled the 70’s southern rock era. Hits from this album such as “The Ghetto” and “Just Walk Away” receive regular airplay to this day. In 2012, after years on the road, Eric entered the studio once again to record a powerful modern Blues record. “Dismantle The Sun” emerged. In 2015, Eric embarked on a quest to record a fully transatlantic studio album with some of the finest producers, engineers and musicians he knew. This led to “Black Gold” being recorded in both Nashville, Tennessee and Amsterdam, Netherlands. Eric’s current album “Polyphonic Prayer” is his most successful album to date and features Eric on every instrument besides the drums.